. : The bass drum pedal : .
. : The hi-hat pedal : . 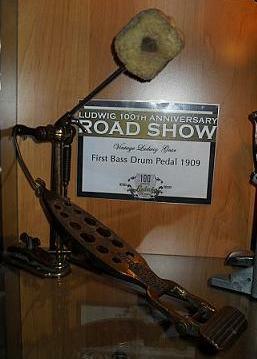 The ancestor of the bass drum pedal appears at the Renaissance in Europe, with the rise of mechanics. It was then called a "one-man band", which carried a bass drum in the back and operated a bat with foot beats or just walking through a cord attached to a foot and connected to the bat. The latter had already the rotating mechanism which is the basis principle of any bass drum pedal. 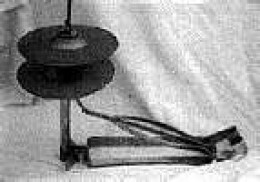 But it was not before the late nineteenth century in New Orleans, the birthplace of jazz, that is invented the first bass drum pedal with different versions (heel or toe operated and first wooden and totally home made and not industrialized or marketed (see one example on photo)). 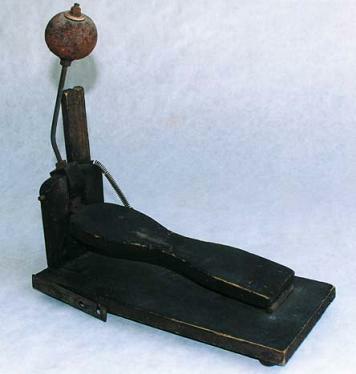 We must wait 1909 to have the first efficient and robust pedal commercialized and patented by William F. Ludwig: the "toe operated bass drum pedal" (opposite photo). Everything is already there: the principle of the pedal, a bracket with axis of rotation and spring (for the return of the bat), the bat with adjustable steel stem ("beater"), jaw clamp with screw to fasten the bass drum pedal on bass drum hoop and above all, it is all steel made (except the head of the bat which stays traditional: fur and wood). The only things that really differs with current pedals is the use of a transmission loop (between the pedal and the beater) also steel made and the absence of ball bearings. 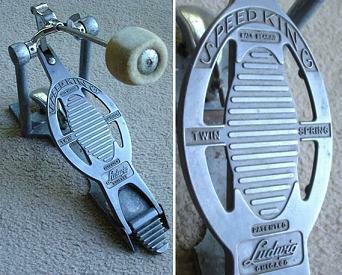 The "Speed King" (more robust with double bracket, ball bearings, double compression springs incorporated in the supporting posts and beater head covered with felt) from Ludwig again, 1937 (conceived by Ray Bauduc and which was used by the greatest masters of the single bass drum pedal: Buddy Rich in jazz and John Bonham in rock for example, in the 1960s, and still today marketed as it was) still offers a direct transmission (with a steel plate this time). Some brands (example: Axis pedals, very fashionable in the extreme metal) try to revive this type of transmission (with a rod this time) which I find for my part not only archaic, impractical, but moreover traumatic for the tendons and joints (due to its very "direct" aspect). It was only much later (first marketed in 1980 by Drum Workshop, which will made the celebrity of the brand Camco bought by Tama, who still sells this model from 1981 today (with some setting improvements recently and is still appreciated for its overall lightness (easily transportable) and low cost)) that it was adapted the system of bicycle ("roller") chain and sprocket yet the most currently used (Gene Hoglan , one of the fastest and most virtuoso double bass drum player in the history (he's nicknamed "The Atomic Clock"), always use simple Camco pedals with chain, for example, which says a lot about the prevalence of body control on the sophistication of the equipment, because the control and speed of the pedal ultimately depend much more on sensitivity and habit, than its ease of use and efficiency in the absolute). Some relatively recent models have a double chain (like the one I use since 2000: Tama Iron Cobra Rolling Glide HP900RTW (photo)), which provides more robustness, reliability, flexibility and silence in playing (some records of John Bonham (Led Zeppelin) of the 1970s with Speed King are famous for their pedal "squeakings" (slow intro of "Since I've Been Loving You", 1970, not devoid of charm because the squeaking is "in time"!)). This system has the advantage of minimizing vibratory shocks transmitted in the foot (but then you lost a little sensitivity, speed and power, it's probably why pedals with metal plate (rod) or strap transmission return to the market recently). 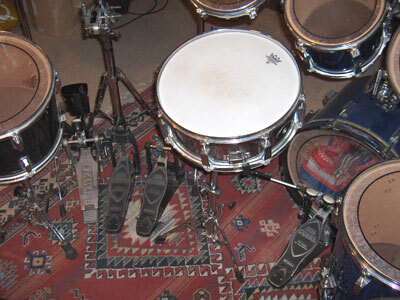 In 1983 appears the bass drum double pedal (invented and marketed by Drum Workshop (DW)), only one frame operates two beaters that turn independently. The first on the right is operated normally, the second on the left is driven through a transmission bar (or rod) and a gimbal (now two, one at each end), by a second pedal provided with a second frame, which can then be placed to the left of the snare and to the right of the hi-hat pedal. 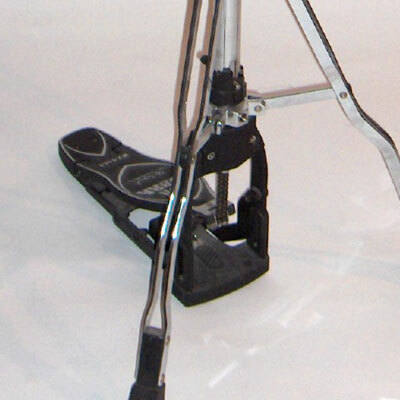 The bass drum pedal sees further improvements in the multiplication of settings (and therefore better ergonomics adapted to each person and his set) and the suppression of notches of sprocket for a felted "rail" (more smooth and quiet) or other details like the ball bearing at the rear of the sole, the jaw with ball head (automatically changing orientation to match the shape of the hoop) and the fulcrum of the lever adjustable in height, the blocking of the adjusting spring screw (above, below or vertical: unmovable when the setting is chosen), adjustable beater head (regardless of its stem) for optimal positioning against the skin, regardless of the length of beater set, the sliding counterweight along the stem (to adjust the weight of the beater head, somebody had to think of it! ), a whole lot of innovations that Japanese brand Tama has developed since 1993 with what I consider still currently to be the flagship of bass drum pedals: the Iron Cobra (and I say this without being paid or endorsed, and after 13 years of intensive use without any problem, and after breaking another model of double pedal after one year ). The model created in 1998 (which I use) still "glides" today above all others in my opinion, and I do not even mention the choice of materials: transmission bar in aluminum (lighter material than the steel) between the two pedals, increasing the speed for a feeling of fluidity of left foot almost equivalent to the right foot, sole aluminum alloy (both hard to resist the friction that reduces anti-slide notches, and light, remaining resistant), steel base with notched rubber bands to adhere to the ground, lightweight plastic beater head with curved felt disc (improving dynamics) or other material by changing beater, chromed steel for connecting pieces etc. : a marvel difficult to surpass in my opinion, except maybe with the new "Speed Cobra" (the previous model is still sold, however, which shows that it is also a matter of taste here) which by its longer sole gives more efficiency (mechanical principle of the "moment of force") and thus sound power (for equal muscular energy and applied on the same place), dynamics and response (Mike Portnoy for example, has increased from one model to the other), but should also ask more playing accuracy (a pedal for the "super-technicians", lovers of extreme speed and endurance). 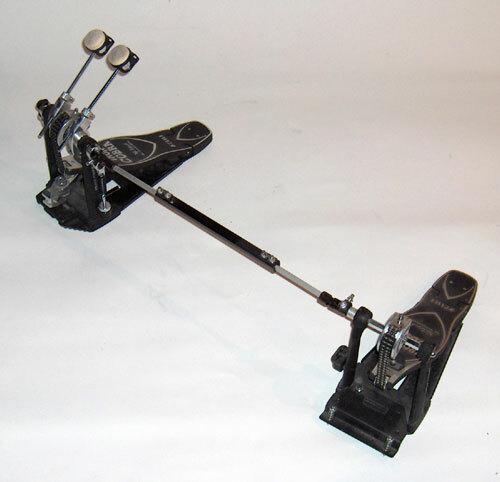 Later than the invention of the bass drum pedal about 10 years (1920), it is initially very low (without tube), modeled on the bass drum pedal and called "sock cymbal" or "low boy" (photo above). The invention of the "high hat" tube for the final hi-hat pedal (left), allows the joint play of the hands and feet (the only musical instrument with this feature). The evolution of the transmission belt has followed a parallel way to that of the bass drum pedal. The best current models allow multiple settings. 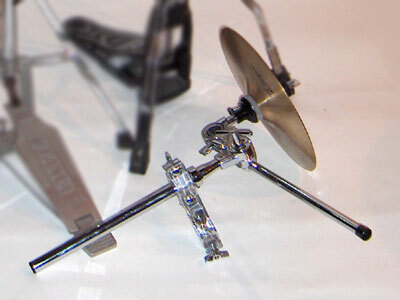 In addition to the height of cymbals (the bottom one by a telescopic tube, such as cymbal stand, the top one with a "clutch" (photo), which is screwed to the transmission rod and takes the top cymbal between two or 3 nuts (to prevent unscrewing)), you can adjust the spring tension, or the angle of the bottom cymbal (for a "fuzzy" play), and also the implementation of the tripod in relation to the pedal by rotating independently of the rest (which is very useful to install a bass drum pedal on the right, but not a supplementary pedal to the left). 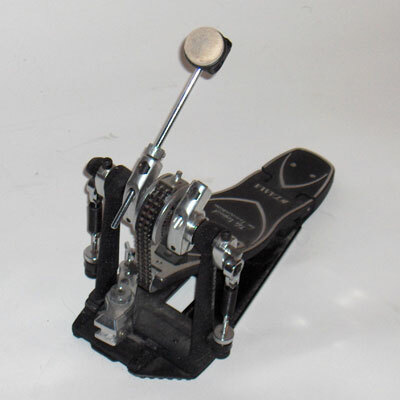 The Japanese brand Tama offers models of Iron Cobra hi-hat pedal with only two legs (photo), which is largely enough stable (the pedal "socle" ("base plate") plays the role of the third base) while reducing the bulk to add other pedals nearby (example: bell stand on left foot to the left and bass drum double pedal to the right). Some recent models offer assistance by a lever system (Tama Iron Cobra again, "Lever Glide"), which divides the amplitude of the action on the pedal for better control of the opening. But it also slows down the "chick", which is why I prefer the old direct transmission (called "velo (for "velocity") Glide" for the other model of Iron Cobra, which I use). 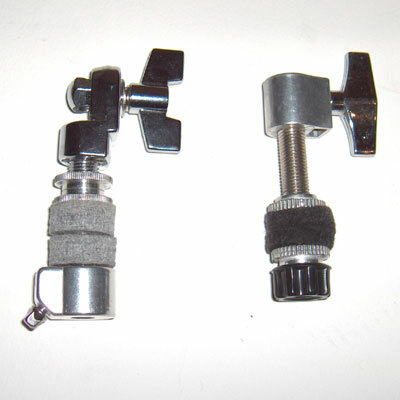 Others , offer a dual use pedal, hi-hat and double bass drum pedal ("Janus" system) by turning the pedal from a portal to another, through a system of "trigger" vise on the foot (very ingenious but technically but not very practical to use, in my opinion, except for reducing space (but there are other easier solutions to do this)). 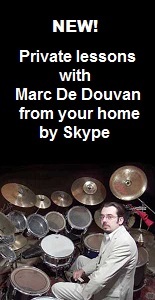 Recent models are justly fitted with a flexible rubber tube and a cable (1985, system again invented and marketed for the first time by DW to play double hi-hat pedal without removing the bass drum pedal, but this system induces very important friction) instead of a stiff steel tube and rod for transmission, or are without pedal and suspended, allowing innovative uses (see "hi-hat" cymbals in the chapter about cymbals).